Home » Articles » Where are the Green Jackets ? Where are the Green Jackets? Where are the Green Jackets at The National Memorial Arboretum in Staffordshire, as far as i am aware the memorial is for the Officers and Riflemen of The Royal Green Jackets, correct me if I am wrong, So what of the Green Jackets or Green Jackets Brigade?. The tribute chair is for all who have served with the Green Jackets and The Royal Green Jackets and rightfully the Green Jackets get a mention at home the ancestral home which has strong community ties dating far back into the history books, the archived history, this is a fitting tribute of a Regiment which has a strong family tree at home ( home being Winchester) honouring the history at home. The poignancy of the chairs are to pay tribute to all who have served in the Green Jackets and the Royal Green Jackets and also for those who have lost their lives whilst serving with the Green Jackets and The Royal Green Jackets, their antecedent regiments (our forefathers) and including their successors The Rifles. A tribute chair, remembering them, at home the Green Jackets and The Royal Green Jackets. A memorial chair, paying respect and honouring, all those who have lost their lives whilst serving with the Green Jackets and the Royal Green Jackets, the antecedent regiments, including their successors The Rifles. It is important to recognise that all of these Regiments have amalgamated into one another, weaving a rich tapestry second to none, each Regiment carrying forward men who have ambition, goals and military tactics and training unique to the Regiment that they have served with, thus bringing forward a strong breed of riflemen. Not only has the Regiment a strong linage but it also has an illustrious history. This history is too important to archive, it must be recognised at home; this history is a legacy of long-standing and real achievements. The chairs at the time of unveiling will mark the 100th anniversary of the Great War and also the 200th year of the Peninsula War too. I want to give a brief trip of yesteryear. The 18th century saw so much conflict between Great Britain and France, both being at war with each other and the respective colonial territories in and around European continents. The British Army was continually changing in size to suit the manpower needs. 1741 saw an expansion with the raising of the 54th Regiment of Infantry which had its headquarters at Winchester, at the end of the war in 1748 the Regiment was in Minorca and reductions in older regiments caused its renumbering as the 43rd, another 54th regiment was raised only to be renumbered as the 52nd a year later, enter the Oxfordshire and Buckinghamshire Light Infantry (43rd and 52nd) Regiments where independent of each other for 140 years from their formation their union into one single Regiment and their crossing of paths in earlier battles linked them together and therefore it is possible to tell their stories as one. 1755 saw a section of the army dressed in redcoats and serving under General Braddock going forward to take Fort Duquesne on the Ohio River, whilst advancing they were ambushed by the French and their Red Indian allies, the General was caught in the cross fire and his dying words were ” We shall learn better how to do it next time”, the reaction at home was one of defiance and brought forward an act of Parliament which provided the raising of a Regiment of four battalions of American colonists bringing forward the 60th Royal American Regiment, it was this Regiment that at Quebec in 1759 rescued Canada from France, it won from Wolfe the motto which is familiar to the Green Jackets and the Royal Green Jackets today ” Celer et Audax” Swift and Bold. This formation had also been the foundation stone for the unofficial introduction of the RIFLE and BATTLE DRESS, which was to become common some 150 years later thus being universal in the Army. This was bought forward by a Senior Commissioned Officer of Swiss heritage namely Henri Bouquet who also introduced tactics, training and man management, which has been instrumental in today`s Army. Moving on after the defeat of Napoleon there followed thirty years of peace the Regiment changed its title first to, The Duke of York`s Own Rifle Corps, who were often referred to as the 60th Rifles. 1858 the Rifle Depot was established at Winchester as the headquarters and training centre for the King`s Royal Rifle Corps and the Rifle Brigade. The Rifle Brigade had emerged by the end of the 18th century due to the creation of an Experimental Corps of Riflemen, these men had followed the formation of the 5th Battalion of the 60th Royal Americans, these men where handpicked from other regiments, skilled and specialised in the roles of skirmishing and reconnaissance, they were dressed in green and armed with the Baker Rifle, it took four months for it to be established as Non-Experimental and was gazetted under the new title of the Rifle Corps. A year later after serving aboard Nelson`s ships at the battle of Copenhagen the first battle honour had been earned, latterly a navel crown in its cap badge. In 1803 the regiment was renamed the 95th or Rifle Regiment, it joined the 43rd and 52nd to form the light Brigade, in 1807 the 95th had two battalions and later that year under Sir Arthur Wellesley who was the future Duke of Wellington both battalions were again Brigaded with the 43rd and 52nd for the siege of Copenhagen. The three battalions of the 95th at Tarbes in 1814 earned sixteen battle honours. Some 100 years on came the Great War 1914-1918. The 25th of August 1914 the 1st Battalion of the Rifle Brigade held up three German Jaegar battalions and a cavalry brigade, during the retreat from Mons they gave such a display of rapid rifle fire that the enemy thought they were under fire from machine guns, then as operations ground to a halt and trench warfare took over, more and more infantry were needed. By 1916 eleven Rifle Brigade battalions were in France and Flanders and one in Salonika. Ten battalions of territorial Regiments served on the western front and also Gallipoli, the Middle East and India. After four years of fighting in horrific conditions facing concentrated artillery machine gun fire, poison gases and flame throwers, the war was won and peace returned. This peace came at a huge cost to human life, the Regiment lost 11,575 men, it is notable that ten VCs were won as well as 1743 other decorations for bravery. The 5th Battalion of the 60th was the first British Infantry regiment to be dressed in Green and the Rifle Corps adopted a similar uniform on formation, the purpose was to be practical and symbolic, you could say the first proper camouflage to lend to the open order tactics and was clean break from the ” Red Coat” troops (there is the Green Jacket). The Bugle, provided necessary communication to the men, because of the open order tactics the men were often beyond the range of the human voice, so the bugle was the most efficient means of signalling to bring forward battle manoeuvres. A complex system of calls was developed to give communication, a lot of them are still in use today, the use of the bugle replaces the drum which other infantry use on parade. The Cap Badge, at the centre is a bugle horn the badge of all Rifle and Light Infantry Regiments. The Maltese Cross comes from the badges of the King`s Royal Rifle Corps and the Rifle Brigade and on its arms are some of the battle honours of the former regiments, the Green Jackets carry no colours so the honours are displayed this way, at the foot of the badge is a Navel Crown awarded to the Rifle Brigade, which commemorates the service of their forebears under nelson at Copenhagen. The marching pace is unique as is the marksmanship, through the introduction of the early rifles this led to a tradition of marksmanship as Green Jackets were required to be sharpshooters of the Army. In the 18th and 19th centuries the heavy infantry moved in close formation at a slow pace; however The Rifles and Light Infantry Regiments frequently on outpost duty needed to move about faster, often at the double. The Royal Green Jackets of today habitually march 140 paces to the minute compared to the standard 120 paces and retain the custom of the double past as a parade manoeuvre. The discipline of the officers of the British Army of the 18th century have been described as mainly incompetent and habitually drunk, their soldiers were drawn from the criminal classes it was the unpromising material which a succession of forward thinking officers many of them associated with former Green Jacket Regiments culminating in Sir John Moore, set to work to turn into a dedicated and efficient fighting force by a system of discipline based on thorough training and encouragement rather than the threat of the lash. Much of the Army was slow to follow, but the principles of mutual trust and respect remain the foundation of Green Jacket discipline today. On January the 1st 1966, The Royal Green Jackets was formed as a single large Regiment, its creation followed on logically from composition of the Green Jackets Brigade in 1958. 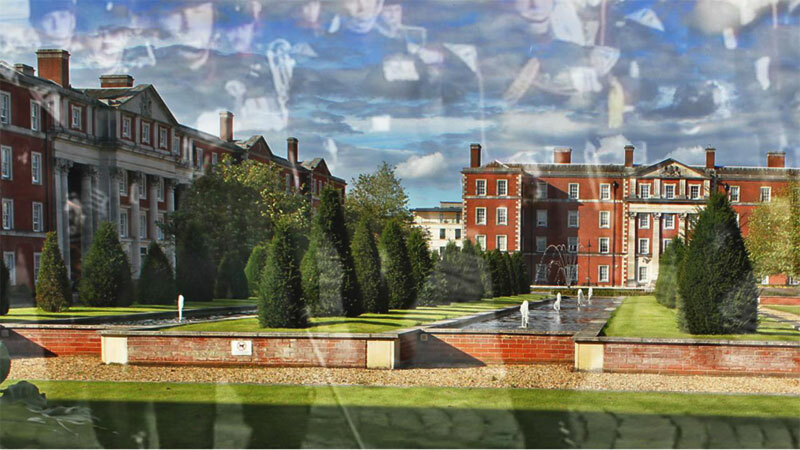 The home of The Royal Green Jackets was Winchester, Hampshire, and Peninsula Barracks, in 1985 the gates of Peninsula Barracks closed. This is Home, Winchester, Hampshire England, once the capital of England. 26 were awarded to The Rifle Brigade. 21 were awarded to The Kings Royal Rifle Corps. 6 were awarded to the 43rd and 52nd. 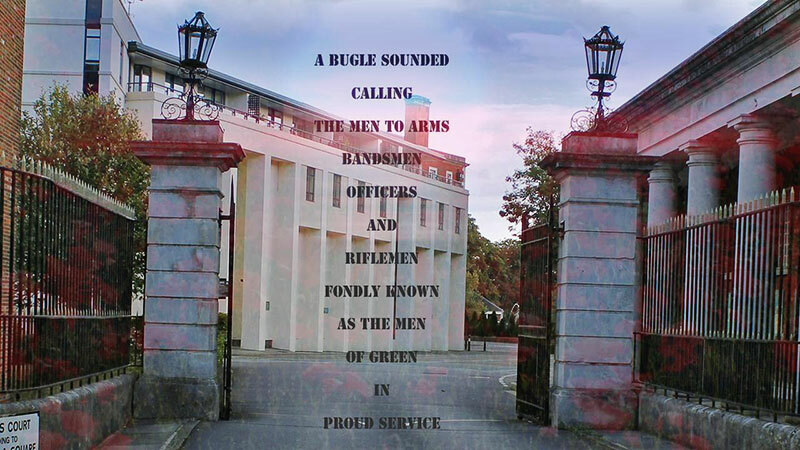 In 2007 sadly The Royal Green Jackets were disbanded and those remaining service personnel re-badged to The Rifles, thus going full circle, “Once a Rifleman – always a Rifleman”. In answer to the question, “Where are the Green Jackets “,? ” They have always been here”, here in Winchester, from their antecedent regiments through to their successors, they must be honoured and the loss of life be remembered so in bringing home the chair we honour all who served with the Green Jackets and The Royal Green Jackets. The in memory of chair honours all who have lost their lives whilst serving with the Green Jackets, The Royal Green Jackets their antecedent Regiments and including their successors the Rifles. In bringing home the In Memory of chair we are still keeping those who gave for our today in memory at home Peninsula Barracks”. The chairs are about history and more than that those that made history. 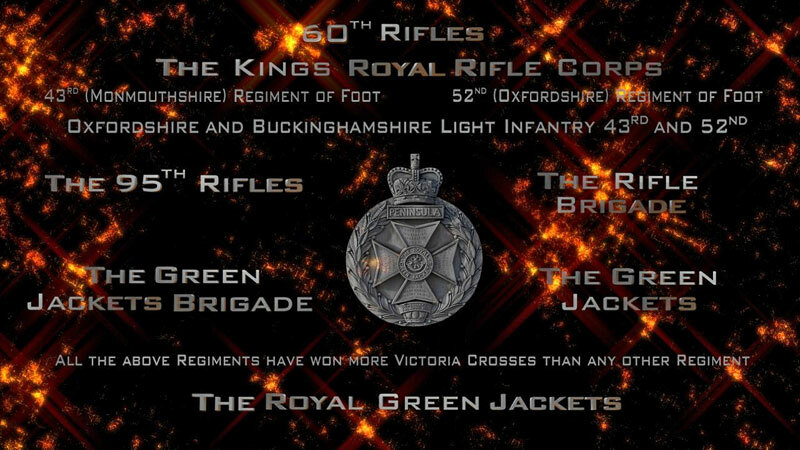 The rich Tapestry of Green, the history, from the uniform of the Green Jacket, the Rifle carried by the Riflemen, the Bugle call to the double past and the traditions taken forward from where they came, Winchester the training depot of so many fine men. The Green Jacket in every thread of the finest historical tapestry, the family of Green. One family of Green, one home, 55 Victoria Crosses, the human cost, the Regiment lost 11,575 during 1914-1918 all died with honour they gave for our today. Today and both during the Second World War and numerous other campaigns across the war torn world, we have seen service personnel of The Royal Green Jackets, the Green Jackets, their antecedent regiments and their successors The Rifles, give for your today, but still their brothers carry forward the Traditions. So from as far back as 1755 these traditions carry forward a mutual trust and respect, I strongly believe that General Braddock himself would raise a smile and say that “those that have followed have done it better this time”. The lesson of past achievements and the example of illustrious predecessors deserve to be remembered and traditions derived from them, keep them alive, but they are no substitute for an attitude of mind which sees the present and the future as a challenge. At Winchester, at Home, remembering the Green Jackets.